If you don't want to take a bite out of your screen right now, I'm not sure we can be friends. Graham Cracker crust. Sweet lime filling. Whipped cream. All of it cold on your tongue and full of zingy lime freshness. 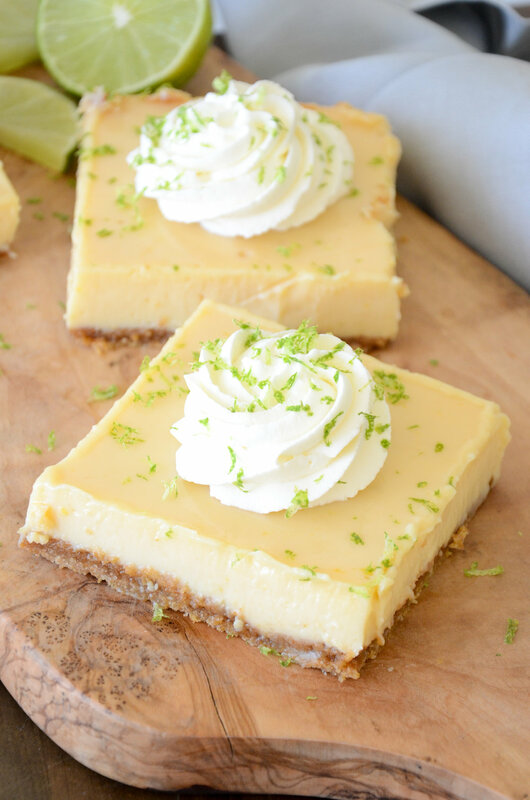 These Key Lime Pie Bars? They are insanely good. Sometimes insanely good things are also insanely involved things. This is not the case this time. As it happens, and perhaps this is a contributing factor to why I love them so much, this insanely good thing is not involved. They are simple. So simple, you will be looking for opportunities to make these because 1.) they taste amazing, 2.) they are easy to prepare, and 3. ), you can make them at least a couple of days ahead and whisk them out of the fridge with flair and finesse. "Can I interest you in a homemade Key Lime Pie Bar? I just happen to have them on hand." Look at you. Working that homemade dessert like a boss. Don't worry about making the whipped cream look fancy on top. If I didn't own a bakery, I'm not sure I would have messed with the pastry bag and tip. These are equally delicious when the whipped cream is dolloped on top with a spoon in any rustic fashion you please. Whatever you do, do not use the stuff from a can or a plastic tub. That's a no-no, and I love you enough to hold you to a higher standard. You deserve better than fake whipped cream, and so do these bars. Click below for the recipe!